Dev Catalyst began in 2013 with the mission of improving technology education and growing tech talent among West Tennessee students. Since then, students from across Tennessee and beyond have joined the program. Dev Catalyst works to cultivate student tech talent in web development, physical computing, UX and data management. Dev Catalyst is rooted in developing student coders who are marketable in today’s workforce and we offer three high school competition categories: Raspberry Pi with Python, Novice Web Development and Data Development. We also offer Raspberry Pi Workshops that function as a great way for students to get a taste. Students in the Raspberry Pi categories gain experience in physical computing as they work with a team to develop a product. Students in Novice Web Dev seek out local businesses or nonprofit organizations to serve as their “client” for a website project to add to their online portfolios. Through this collaboration between client and student, students further develop their professional and coding skills. Our Data Dev track teaches students to implement and utilize relational database systems that their dev team can use in creating their data-driven applications. Interested yet? 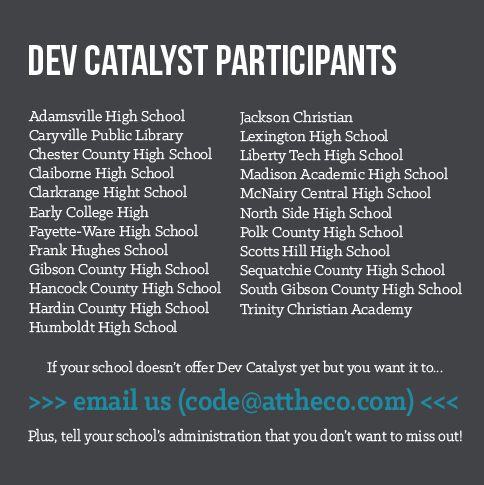 If your school doesn't yet offer Dev Catalyst click to learn more! 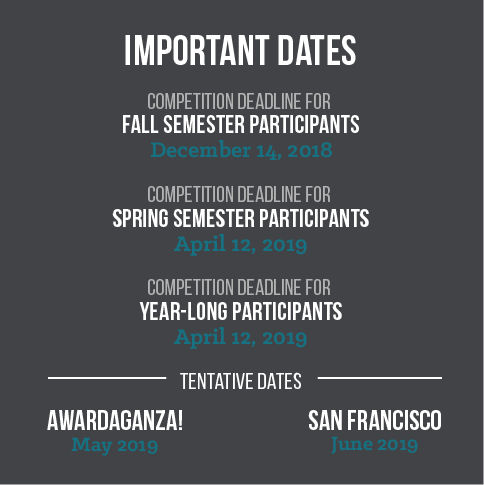 Dev Catalyst rewards the top performing students at an event with awards such as trophies, mini iPads and all-expenses-paid trips on our San Francisco Tech Tour. The Tech Tour includes visiting companies such as Google, Facebook, LinkedIn, and Pivotal Labs. Speaking of special projects, we've created Student Dev Teams that have worked on awesome projects in the community. Get more details about each dev team by clicking on the following: Summer of 2016 Socktober website and Summer of 2017 Jackson-Madison County Library's Big Read website. We look forward to future project opportunities for some of the best and brightest of the students in the program. Access to attend our CO:de meet-up, targeted to technology focused individuals. Are learning to Code. are you among them?